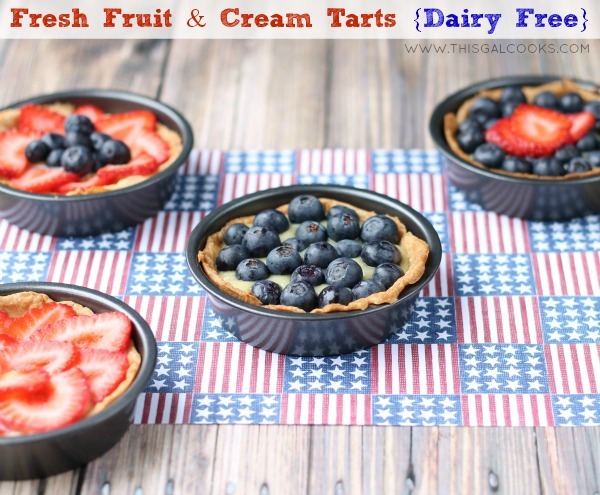 Perfect for a hot summer day, your next gathering or just for the heck of it, these Dairy Free Fresh Fruit and Cream Tarts will put a smile on everyone’s face! I love fresh berries. Strawberries are my favorite. The funny thing about that is that I used to hate strawberries. When I was a kid I used to love them. Then one day I ate too many of them, got sick and associated getting sick with eating them. I didn’t touch them again for many years. Then about 3 years ago, I started to grow fond of them again. Now let me make it clear. My aversion to strawberries only included fresh strawberries. Jam, jelly, ice cream, glaze; those items were ok to eat. I know, I’m a weird one, aren’t I? Blueberries are pretty good as well but I am kind of picky about them. I prefer cooked over raw but I do like them raw in salads. 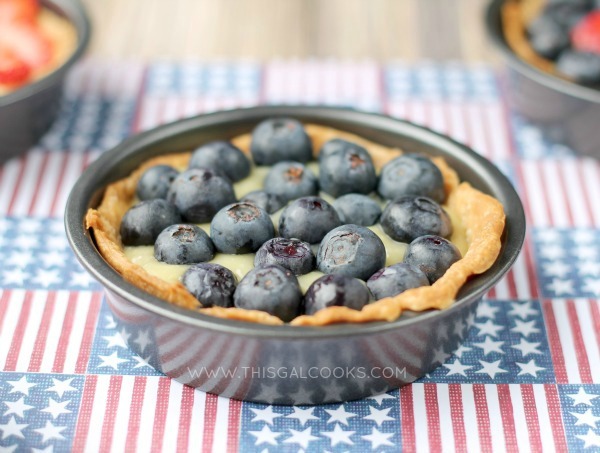 I haven’t tried one of these tarts with the blueberries yet but I did try one topped with strawberries only. It was oh so good. Dairy free and oh so good! I’ll admit, I was a little skeptical to make this type of recipe with coconut milk rather than dairy milk. I never made tarts before. These were my first attempt. I was worried that the recipe wouldn’t turn out well. The worries were over once I tasted the cream filling. Seriously, I was scraping the leftovers out of the bowl after I filled the tart cups. It was that good! I hope you enjoy this recipe! 1 refrigerated pie crust. I cheated and used store bought. Don't worry, it's a dairy free crust! Mix together the cornstarch and sugar. Place in a medium saucepan. Turn on the heat to medium and gradually add the coconut milk, continuously stirring. Heat until thickened and bubbly and then cook for 2 more minutes. Remove the pot from the heat and pour about 1 C of the mixture into the egg yolks. Whisk together and then add the egg/cream mixture back into the mixture in the pot. Bring to a slow boil and stir for 2 minutes. Remove from the heat and add the vanilla. Mix well. Pour the cream mixture into a glass bowl, cover and refrigerate for 4-5 hours. When the cream mixture is about done chilling, roll out the pie crust and cut into 4 5 inch circles. I used a small bowl to do this. I was only able to cut out 3 so I took the dough left after cutting the circles, rolled it out and cut one more circle. Place the dough circles into 4 inch mini tart pans.Poke holes in the bottom and side with a fork. Line each tart with aluminum foil and then place the tarts on a baking sheet. Bake at 450 for 8 minutes. Remove the foil and then bake for 5 more minutes or until the crust is golden. Allow the crusts to cool to room temperature and then fill them with the cream filling. Top with fresh berries. Adapted from Better Homes & Gardens New Cookbook, 1997. Gorgeous, Julie!! I love coconut milk in recipes but haven’t tried it as a substitute for milk. What a good idea! I have never had blueberries in salad, but you have made me want to try that out too. Happy Fourth of July! Thank you, Andi! I’ve really been enjoying using coconut milk rather than milk. Today I made coconut whipped cream. It’s so good! Thanks for stopping by! Hope you had a wonderful 4th. These look incredible Julie!! Love love love fresh strawberries!!! Thank you, Nancy! I am on such a huge strawberry kick right now. I can’t seem to get enough of them! 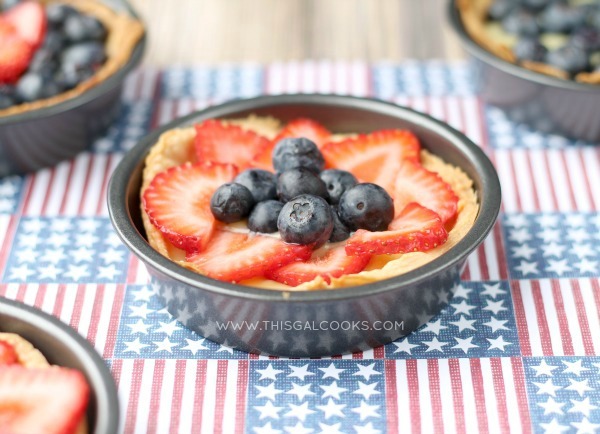 These tarts are so adorable! I’ve always loved strawberries. I must run out to the store and get me some coconut milk ;) Happy early 4th of July, Julie! Thank you so much, Min! I hope you enjoy the recipe. I am loving coconut milk right now. It’s such a great, tasty milk substitute! Hope you had a great 4th! Beautiful!! This would be perfect because I always want more crust! LOL, more crust is good! Thank you for stopping by, Paula! 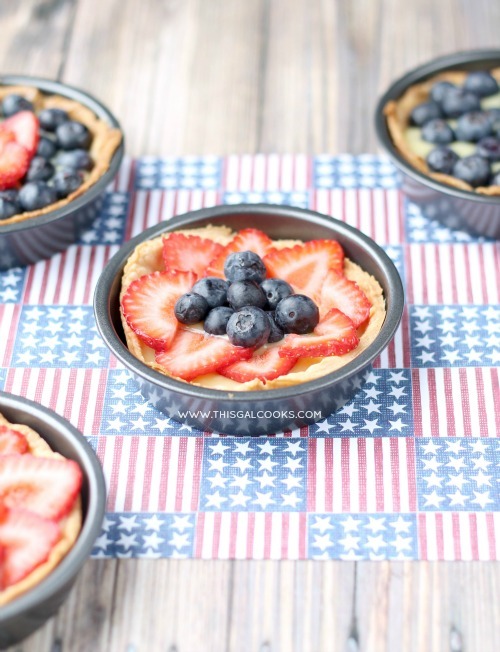 These look like a great dessert for the 4th, love how you arranged the strawberries especially. I came home from Costco with LOTS of strawberries today and think your dessert looks like a great way to use them. Julie, these look pretty awesome for your first tarts and I would definitely like to try a coconut milk version. Thanks for sharing your recipe and of course, pinning! So festive Julie – pinned and sharing FB this week! Yes, it sure is! Our minds do some weird things. I’m happy I finally got over that phase. Thank you so much for stopping by! I love that these are dairy free Julie. Amazing job! I love the festive, fresh fruits. LOVE these, Julie! So pretty and love the fresh ingredients! :) I actually love baking with coconut milk in my recipes. Thank you so much, Carrie! I really enjoy using coconut milk. I made coconut milk whipped cream today. SO GOOD! YES! I would love these as lemon tarts since I am such a lemonholic. LOL. Thank you so much for stopping by, Julia! These tarts are so cute! I love the combination of blueberries and strawberries together. YUM! Isn’t coconut milk fun? I made the best chocolate cream pie today, with coconut milk :) Your tarts are so pretty Julie! YES! It sure is! I made coconut whipped cream yesterday. It’s so good! Thanks so much for stopping by, Lisa! Love that you used coconut milk. Fruit and cream tart is one of my all time favorite desserts. Thanks for sharing on Thursdays Treasures. This will be a feature. These are super cute and look delicious! Thank you for sharing the recipe! These are really pretty and sound delish! Thanks for linking to Saturday Dishes. Thank you, Linda! And thanks for hosting! Oooh! This looks yummy! Pinning! The custard should not be lumpy. It should be smooth. Did the lumps happen during the process of adding the eggs to the heated coconut milk mixture? If so, did you first add the 1 C of heated mixture to the eggs and whisk before adding back to the rest of the mixture? This step is called tempering and is essential to prevent the eggs from scrambling (which would cause lumps). Hope this helps. Let me know if you have any other questions. Hey, Can the coconut milk be substituted for almond milk, oat milk, or another milk alternative? My sister is allergic to coconut but I would really like to make this recipe. I’ve never made it with almond, oat or any other milk alternative so I can’t say whether or not the recipe would work with one of those milks. Full fat coconut milk is thicker and has more fat than almond or oat milk so I am thinking those milks wouldn’t work.